Engine Four stroke, 90° V twin, longitudinally mounted, OHV, 2 valve per cylinder. Anyone who's ridden on ice, snow or mud will know that the biggest prob/em is stopping. Front braking is out because you don't want the front wheel slipping away. You rely on engine braking — of which the Imola has its fair share — and where it can't be avoided, a touch of rear brake. With the Guzzi's linked brakes however you have no choice but to use Ihe brakes together which on a really tricky surface liked packed snow can test your riding skills. On one particular runback from MIRA in a near blizzard it seemed that every little dab on the rear brake pedal had the bike swinging like a speedway bike; or should that be ice racer? We're talking about pretty cold conditions though, cold enough to freeze up the brakes altogether one morning. Oh for the summer or a position in California! A very pretty bike to look at, the Imola II is well finished off. Tank and bodywork fit well and the seat blends in superbly well with the general lines of the bike. It's comfortable too. It was a bit tricky calculating accurate mpg figures before the speedo cable could be replaced but it never seemed to dip below 40mpg and was often in the mid-fifties. And that's with the throttle mostly against the stop. 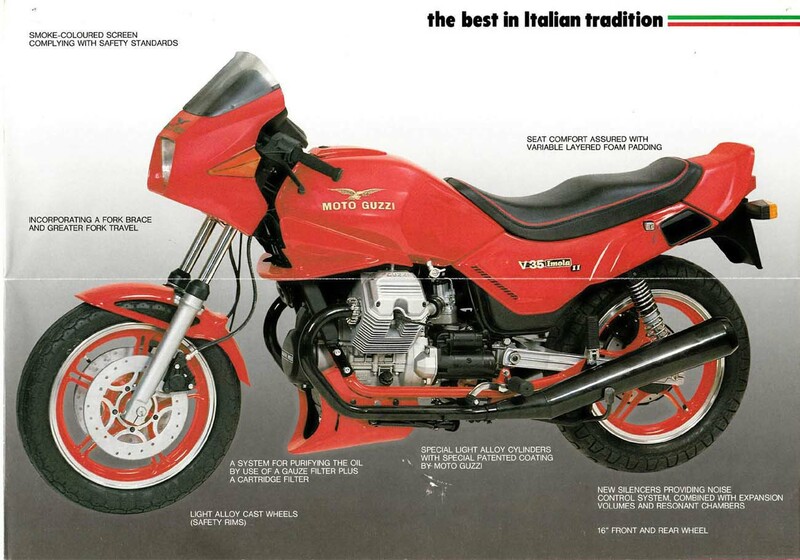 In many ways one could argue that the Imola is an over-engineered bike, sharing so many components with the bigger Guzzi V-twins, but look at it this way, you're getting better value for money and that's nice to know when you're being asked to pay nearly 2V2 grand for a 350. Sure, it could to with a bit more power but if that's your bag, buy a larger Guzzi. All Guzzis are a doddle to maintain — even these four-valvers. 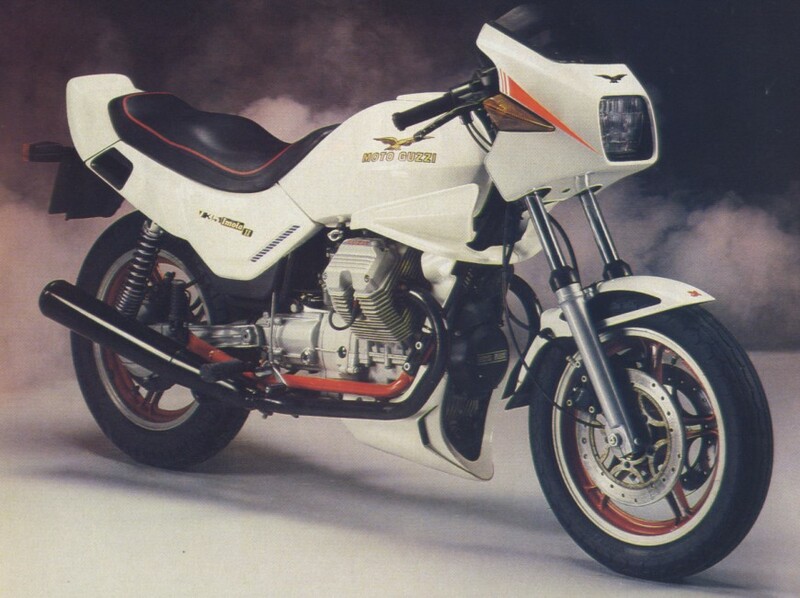 Another big plus point is the high resale value and few model changes which is a hallmark of the Mandello V-twins. Some people might argue that the Japanese have caught up in terms of handling and longevity and that Guzzis are running out of 'traditional virtues'. The only problem with this hypothesis is that when stood next to a Japanese middleweight the similarity between it and the Imola is less than ever. The classy Italian styling is unique, the motor feels 10 times more 'real' than any comparable Jap roadster and the exhaust note is nothing short of extraordinary. That might just have something to do with the fact that the Imola wasn't really intended for the British market and consequently those black chromed silencer aren't as stuffed up as those on the V65 Lario. No way could the sound be described as offensive, just. . . unusual. Guzzis — you love 'em or you don't. Me? I'm not sure. Beauty costs money and you've got to be an art lover to appreciate something like the V35 Imola II. Not state of the art, more art for the sake of it. Right: Is the Imola beautiful? Is the Pope a catholic?